A large sunny apartment, 120 sq. meters, this 3 bedroom 3rd-floor gem has a large living/dining area with flat screen TV, two tiled remodeled bathrooms, a modern kitchen, three bedrooms with ceiling fans, and marble floors. A comfortable futon accommodates 2 additional people. For relaxing entertainment, the smart TV displays online or smartphone content like movies, videos, and social media using screen mirroring, Wi-Fi Direct, Apple TV, or Samsung TV apps. The Hi-Fi stereo plays music files from smartphones for listening enjoyment. The apartment features air conditioning and heating throughout. As always, the outdoor beauty beckons through a wide expanse of glass doors affording spectacular views of the blue Mediterranean. The spacious patio and rooftop are perfect for dining 'al fresco', entertaining, and enjoying life's pleasures. The swimming pool awaits in a lush garden setting overlooking the Sea. El Tuhillo is a scenic seven minute walk to the centre of town. More photos available upon request. Nerja is Unique: Nerja enjoys the ambiance of the 'old world' Spain, with its beautiful winding streets, whitewashed houses, as well as pretentious tiled homes behind garden walls. Enjoy as many as you can of the 500 restaurants, sidewalk cafes, and tapa bars. Dancing, Spanish music, and entertainment fill the late night hours until dawn, when you can enjoy champagne and watch the sun rise. Nerja is filled with excitement and adventure sufficient to create romantic memories that will last for years. A Walker's Paradise: Whether you like to 'shop till you drop', or hike a more challenging route, Nerja has it all. Shops selling Spanish leather goods offer glorious bargains in shoes, handbags, and jackets. For a beginner's adventurous walk, just below El Tuhillo is a trail alongside the Mediterranean, through giant boulders where you enjoy the Sea lapping at your heels as you walk through miraculous scenery. The trail leads you to the Balcon de Europa, the centre of town. Hikes nearby in the mountains of Frigiliana afford a more zestful challenge above that historical old Moorish town. Things To Do: From Nerja, by bus or car, it is only a day trip to glorious Granada, site of the Alhambra Palace. Likewise to Malaga, one of the oldest cities in the world. From Malaga one can take a boat to Gibraltar or Morocco. Closer to Nerja are the prehistoric caves which offer ballet and music in the summer. Fiestas abound during the year but especially summer. Street-side 'Tuesday Market' offers countless bargains, and follow that up with a seaside dinner at Burriana Beach, of fresh, grilled fish, patatas fritas, cerveza, and paella served from a pan so large it is stirred with a shovel by none other than 'Aiyo' himself. Yearly trips around Europe for this family of 6 gave us the privilege of viewing many beautiful coastlines, but it was an easy call that this coastline view from El Tuhillo was the most beautiful ever. It couldn't get any better. All these years later when I visit the apartment, I still take view pictures each day. We are truly blessed. Two bathrooms, one with new glass shower; beautiful tile work. A large communal area with frontline views of the Sea. A starter kit in the refrigerator is provided for all new arrivals. Dine inside or enjoy dining al fresco on the patio. Large garden with two sunbeds by the pool, or as you please. A spacious balcony with two sunbeds, table and chairs overlooking the vast Mediterranean. Incredibly beautiful view! Sail boats are available up the coast a short distance. Rooftop: Barbecue charcoal grill, with sunbed, table, chairs. Unlimited incredible ocean view. Several golf courses in the area. It's in the garden overlooking the sea, but people seem to prefer going down the steps to the beach. A complimentary welcome food pack awaits you in the refrigerator. Local manager is available for you to call during your stay for help or information. She is easy to communicate with and most congenial... Please ask for more information, more photos and clients' endorsements. July/August the pay parking facility is necessary, but cars are not really required. 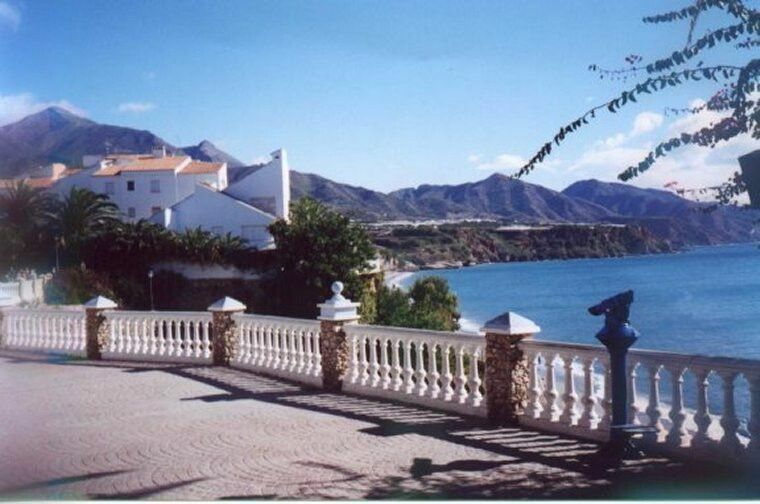 It is a short walking distance throughout town, and to Burriana Beach. Public buses to Frigiliani, Granada, Sevilla and cars are available to rent locally. This apartment is spacious. I stayed with 4 adults and 3 children and we had no problems sleeping comfortably and spending time there together. The kitchen is well equipped, however note that there is no dishwasher. The beds are comfortable and there are plenty of towels for bathing and the beach. There are also beach chairs and evening a rolling shopping bag/cart so you don’t have to carry your groceries through town. My favorite thing about the apartment is it’s excellent, really ideal location. In a leisurely walk to the old town Nerja is 9 minutes on a very nice footpath that is not stressful at all with kids. To reach Burriana Beach is 12 minutes, the way up from the beach is uphill, but we didn’t find it strenuous. Old town Nerja is really nice with lots of excellent restaurants and a vibrant feel. This apartment is away from the noise of it all, but still so central. We thoroughly enjoyed our stay and highly recommend it. I am so glad you had a good time and enjoyed your stay in the apartment.Glad to hear you had everything you needed. We would love to have you back again in the future. Great apartment and amazing view. Stayed for a week in August, we all loved it. Very spacious apartment with plenty of room for everyone. Location is great too with all beaches and the centre of town all walkable in 10 minutes. Beautiful Apartment in a fantastic location!! Apartment was very spacious and clean with fantastic views! 5-10 min walk to the beach and The Balcón which is full of restaurants and live music in the square. Would love to go back!! We stayed here with my family 8 in total with plenty of room. Penthouse apartment was perfect for our family we even had a barbecue on the balcony. Sue was very professional helping out along the way would certainly recommend this home from home. Pool was well used and other holiday makers friendly with the young ones making friends. The apartment had everything you would need for a perfect holiday extra beach towels, parasol, beach chairs, plus much more. We Love Nerj it's got to be the best locations on this coast line. Thanks for letting this penthouse. This was my second visit to this condo. The party consisted of myself, my wife and her two sisters. The condo was perfect. The views from the balcony had us not wanting to leave the place. It has three nice size bedrooms and a well equipped kitchen which also has a washing machine. The condo has a rooftop terrace that you can relax on but it also has a clothes line that we used to dry our clothes. It was very clean and ready to use. Sue Fuller was very helpful and available if we had any questions. I would highly recommend this place to anyone who wants to enjoy the beautiful town of Nerja. I couldn't ask for more. It has always been our goal to achieve the highest standards possible. Blessed with the incredible Mediterranean Sea views, and the ultimate location in Nerja, the extra blessing is our quick, responsive Apt. Manager Sue. We are most pleased to receive such a complimentary review. We Didn’t Want To Leave!!! Nerja was even more beautiful than we expected! The only thing that made our experience even more of a pleasure was our penthouse overlooking the Mediterranean! The pictures of the apartment that are posted on the site and especially those of the view don’t do the place justice. Every morning there was a spectacular sunrise that we couldn’t help but photograph. The apartment was well appointed and furnished, and Sue, the property manager, even provided us with a high chair and a portable crib for our little nine month old grandson. Sue was prompt, helpful, and very responsive to all of our inquiries. There couldn’t be a better location for exploring the town, the beaches, not to mention little grocers and bakeries and cafes! We’ll definitely be returning to Nerja, the perfect vacation spot!!! Golf: Public/Private golf course 20 minutes distance. Inquire for more information. Ski: Nerja is 1.5 hours from the ski slopes of the Sierra Nevada Mountains near Granada. Inquire for more information.